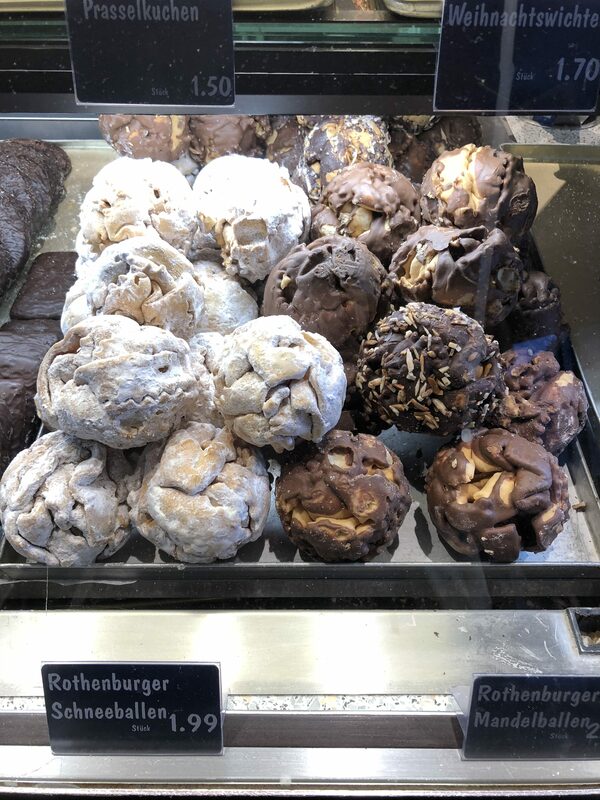 I recently spotted these “schneeballen” at the bakery counter of my local supermarket. From Rothenburg ob der Tauber in Bavaria, these delicious cookies are actually made from strips of shortcrust pastry, draped over a wooden stick or spoon to shape into a ball. They are then covered in powdered sugar. The chocolate version on the right has sprinkled almonds on top. They’re quite large – the size of a tennis ball – and made for a great after school snack for the kid. Seeing these Schneeballen reminded me of Rachel Snell’s excellent post from 2015 on the American dessert “snowballs”. Enjoy! For most readers, snowballs likely conjure memories of childhood winter games or, perhaps, the small, rounded cookies covered with shaved coconut or powdered sugar often prepared around the winter holidays. Of course, there is also the Sno Ball snack cake (cream-filled chocolate cakes covered with marshmallow frosting and pink coconut flakes), first introduced to American supermarkets in 1947. The association between snowball named treats and coconut is a decidedly mid-twentieth century convention, likely due to the increased affordability, availability, and accessibility (dehydrated flakes) of this tropical fruit. In the nineteenth century, snowballs took a decidedly different form depending on the region where they were produced, revealing the intermixing of gentility and frugality that occurred in rural or peripheral areas. My research suggests there were several versions of Snowballs circulating within the Anglo-American world during the first half of the nineteenth century. These versions of Snowballs were essentially apple dumplings served with a sauce or icing. One particularly sumptuous version consisted of whole apples, cored and filled with orange or quince marmalade, covered in pastry and baked. Once removed from the oven, the Snowballs were covered in icing and set near the fire to harden. This description of Snowballs comes from Colin Mackenzie’s Five Thousand Receipts, first published in England in 1823 with several expanded American editions between 1829-1860 that were readily available throughout North America. The comparative extravagance of this recipe is unsurprisingly since Mackenzie’s recipes appear to be aimed at a middle-class or higher audience with many elaborate and costly recipes. Snow Balls, Colin Mackenzie’s Five Thousand Receipts (p. 182). The American variation on this dish, appearing in several sources such as an entry for Snowballs in Caroline Hayward’s manuscript recipe collection and a clipping pasted into an edition of Catharine Beecher’s Miss Beecher’s Domestic Receipt Book, is a dish consisting of peeled and cored apples, flavored with lemon peel, cinnamon, and cloves, and tightly wrapped in cooked rice. Hayward’s recipe instructs the cook to tie each apple “up in a cloth like dumplings.” The finished product would resemble Mackenzie’s Snowballs, but with rice in the place of pastry. These recipes are sometimes labeled Carolina Snow Balls, a reference to the use of rice. Since this version did not require the butter and refined wheat flour required for pastry or the costly marmalade, it may have been more economical to produce for family suppers or those with limited means. Caroline Hayward Recipe Book, 1815-1834, Massachusetts Historical Society. 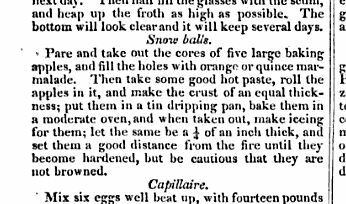 The Frugal Housewife’s Manual, printed in Toronto in 1840, presents a related, but decidedly unusual version of Snowballs. 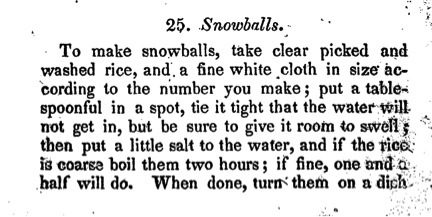 A.B., the anonymous author of the Manual, undoubtedly had access to Mackenzie’s Snowballs recipe. Five Thousand Receipts was a major source for the Manual, nearly the entire cake section and many of the pudding recipes were adapted or copied from Mackenzie. Unlike the American versions, A.B. omitted the apples entirely. An unusual choice since apples would have been readily available in the Lake Ontario region. 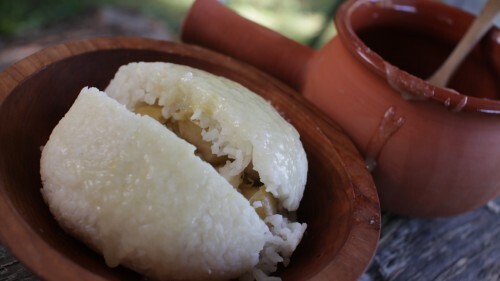 This incredibly simple recipe consists of balls of boiled rice, sifted with loaf sugar and served with “wine sauce is best with them, but butter and sugar with them is very good if they are kept warm.” It is easy to imagine the source of the name; these balls of boiled rice covered with sugar glistening in the candlelight likely bore a striking resemblance to the snowballs manufactured by local children. It would be a very pretty dish and an economical one as well. A.B.’s Snowballs were likely adapted to make the recipe better suited to regional cooking and entertaining habits. Her recipe for Floating Island, a popular nineteenth-century dish of French origin consisting of meringue floating on vanilla custard, has likewise been significantly altered to both simplify and economize the recipe. A.B. suggested serving her recipes for Floating Island and Snowballs together, which would produce a dramatic effect, Floating Island “is a very ornamental dish by candle-light, together with a dish of snowballs on the opposite part of the table; in exchange for a snowball you get a bit of floating island.” Allowing the housewife to impress her guests with manageable effort. Thus, the recipe for Snowballs was tempered with frugality from the sumptuous and elaborate dish presented by Mackenzie, to the American variation that substituted cheap and plentiful rice, and finally A.B.’s version, which avoided expensive ingredients and time-consuming labor to produce a dish pleasing to both the eyes and the taste buds. Note: For those interested in attempting to make Snowballs in their own kitchens, Kevin Carter has an excellent post at Savoring the Past with instructions to make two versions and a discussion of rice’s connection to the American slave system. And we cannot forget the Baltimore Snowball, an iconic concoction of shaved ice and sweet syrup, often topped with marshmallow cream. More information about this local treat is available here. Colin Mackenzie, Five Thousand Receipts in all the useful and domestic arts (Philadelphia: James Kay, Jun. 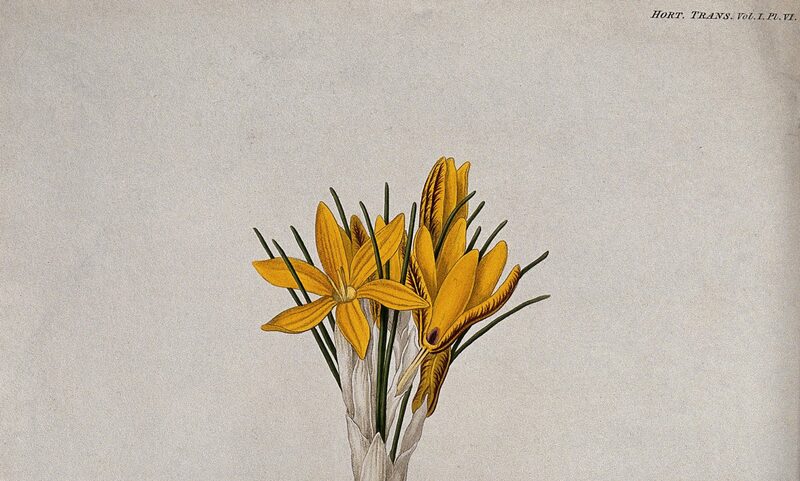 & Co., 1831), 182. 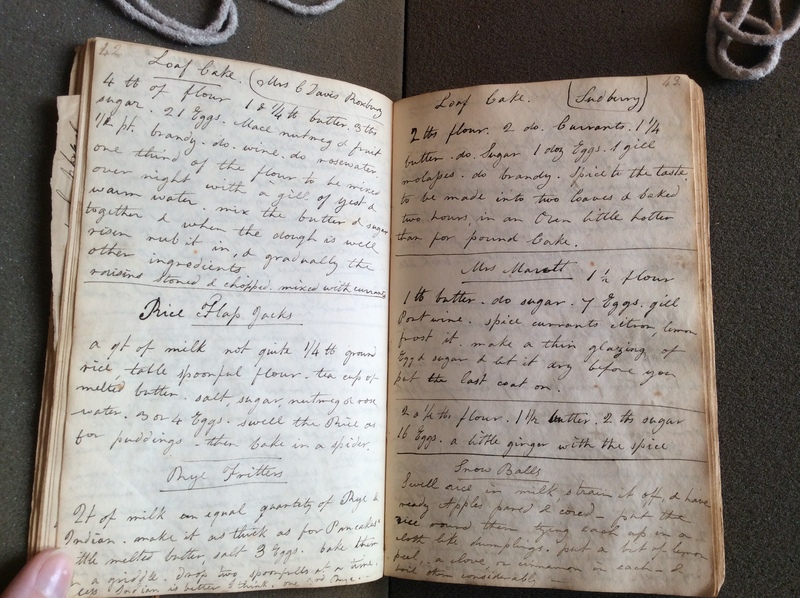 Caroline Hayward Recipe Book, 1815-1834, Joseph H. Hayward Family Papers, Ms. N-2368. Massachusetts Historical Society, Boston, MA 02215. A.B. of Grimsby, The Frugal Housewife’s Manual: Containing a Number of Useful Receipts Carefully Selected, and Well Adapted to the Use of Families in General (Toronto, Ont. : J.H. Lawrence, 1840), 10. A.B., The Frugal Housewife’s Manual, 9. Mrs. (Lydia Maria) Child, The American Frugal Housewife, Dedicated to Those Who Are Not Ashamed of Economy (New York: Samuel S. and William Wood, 1838), 6; Catherine E. Kelly, “‘Well Bred Country People’: Sociability, Social Networks, and the Creation of a Provincial Middle Class, 1820-1860” Journal of the Early Republic 19, no. 3 (1999), 451-479. While researching German plague treatises I became fascinated by one odd treatment for buboes that appeared again and again, despite sounding so far-fetched. One sixteenth-century version calls for plucking the feathers from around the single hole in a chicken’s backside, then placing it on a person’s bubo. The instructions say to hold the chicken on the bubo until it dies, when it must be replaced with a new chicken, similarly plucked. I soon dubbed this the “live chicken treatment for buboes” and after years of casual encounters I began to track the recipe more systematically. As strange as it sounds, versions of this “live chicken treatment” were fairly common in plague writing, beginning with the Black Death and lasting, amazingly, into the eighteenth century. Tracing the long history of this recipe led me to explore questions such as: Where might this come from? Why chickens? Why might healers think that this was a good idea? Did anyone actually try this or is this all theoretical? As a historian, I was also interested in change over time within the recipe. Here I found much to explore, as I followed the recipe’s twists and turns over a seven-hundred year period, roughly 1000 to 1700. The “live chicken treatment” turns out to have a long history, indeed. Its origins seem to lie in Avicenna’s Canon of Medicine, although it may be older than that. Chickens and chicken broth were a common source of medicine in early times, probably because chickens were such ubiquitous and useful animals since antiquity. Not only did Avicenna praise chicken broth for its general benefits for the body, but he also recommended placing a cut chicken on a poisonous bite or sting in order to fight poisons. In later centuries European physicians turned to Avicenna’s advice when they faced the mysterious and devastating epidemics of the fourteenth century. 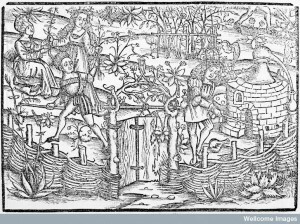 As Europeans emphasized the poisonous nature of the plagues around them, older treatments for poisons drew new attention. The first mention of using a chicken rump to draw poisons out of a bubo appeared in the very first plague treatise of 1348, coming in response to the so-called Black Death. Here the Catalan author Jacme d’Agramont seems to have introduced a novel and lasting adaptation of Avicenna’s recipe, although the “cut chicken” version persisted in plague treatises for centuries to come. Most interesting for the history of trying and testing cures are the many variations of the “cut chicken” and “chicken rump” versions of the treatment, as well as physicians’ comments about how effective they are. Especially after 1400, physicians seem to be thinking about this recipe quite often as they seek practical treatments for the plagues of the time. Physicians were preoccupied with altering the recipe in order to reason out the nature of the mysterious poisons underlying the plague. Some add substances to the process, such as salt placed on top of the chicken as it is placed on the bubo. During the fifteenth century, a number of German physicians began to explain the treatment’s workings in a strikingly physical way—that the chicken breathes through its backside and thus pulls the bubo’s poisons into itself. This change led to the suggestion to hold the chicken’s beak shut during the treatment in order to force the chicken to breathe from below. My article (accessible here) show how all aspects of the treatment changed over time as physicians engaged with the recipe, including the quantity of chickens used, the amount of time required, and even the type of animal in question. This work demonstrates the importance of the recipe itself as a platform for thought, experimentation, and communication among physicians. Perhaps a surprise to modern readers, many physicians praised their version of the “live chicken treatment,” describing it as effective and desirable. 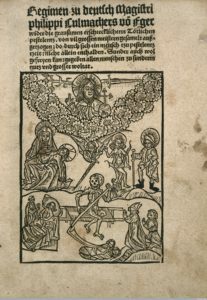 Such comments multiply after the introduction of print, which encouraged the production of plague treatises, some fitted with fetching cover illustrations for the marketplace (see image below of Philippus Culmacher’s treatise of circa 1495). 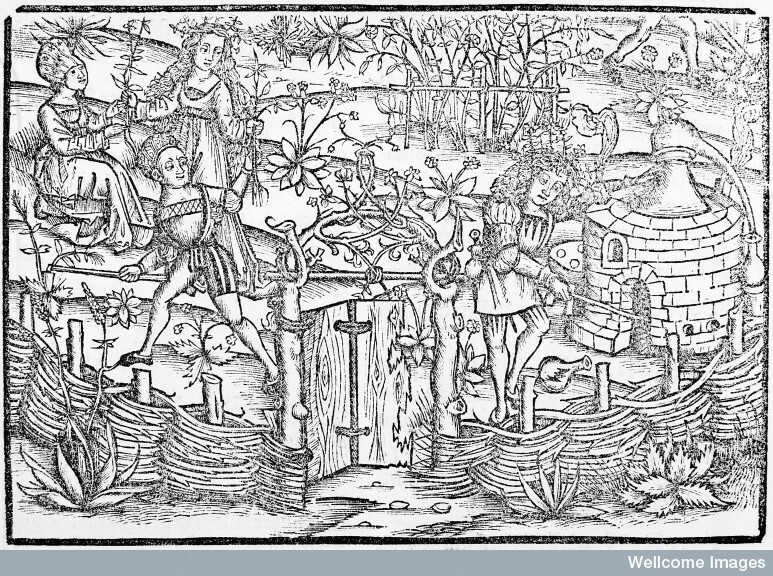 In German-speaking lands especially, sixteenth-century physicians used their printed plague treatises to promote their own services and expertise at a local level. This brought about a change in the genre whereby physicians seem more eager to discuss their own experiences with effective recipes in order to appeal to the practical interests of a broad audience. Amidst this change comes evidence that some German physicians witnessed first-hand the successful use of the “live chicken treatment.” Another interesting change during the sixteenth century is the increased attention to the bodily warmth of the chicken as the treatment’s active healing force. These emergent views provide a tantalizing link to modern medicine, since moist heat remains one of the treatments for buboes today. For more information, please read my article. Erik Heinrichs is an associate professor of history at Winona State University (Minnesota). His interests are the history of medicine and religion in the late medieval and early modern periods. 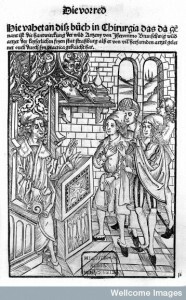 His book Plague, Print, and the Reformation: The German Reform of Healing, 1473-1573 will be published by Routledge this November. For a survey of German plague treatises from the first century of print, see: Erik A. Heinrichs, Plague, Print, and the Reformation: The German Reform of Healing, 1473-1573 (London: Routledge, 2017). Having recently finished my doctoral thesis on the printed works of Hieronymus Brunschwig, which have previously featured on the Recipes Blog (here and here), I am delighted to contribute to this series of posts on testing and trying (for an overview, see our re-posted summary of the Testing Drugs and Trying Cures conference). What better opportunity to share how it all came together, and reflect on the role of recipes and testing in the narrative. 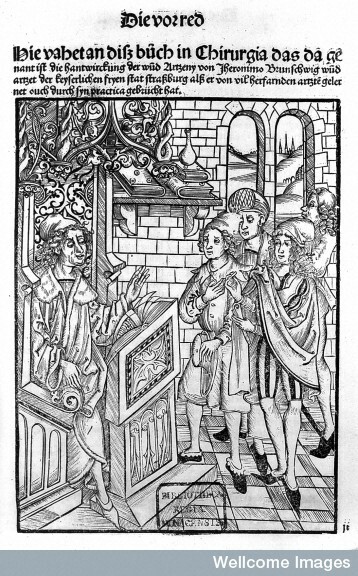 Hieronymus Brunschwig (c.1450–c.1530), a surgeon and apothecary from Strasbourg, wrote the first printed books on surgery and distillation. In my thesis, Hieronymus Brunschwig and the Making of Vernacular Medical Knowledge in Early German Print, I read these uncommonly practical and technical books alongside records from the Strasbourg archives, about the craft guilds and medical practice. This allows us to make sense of Brunschwig’s practical vernacular medicine in relation to local intellectual trends, different forms of healing, the local milieu of guilds and artisans, and early German print culture. 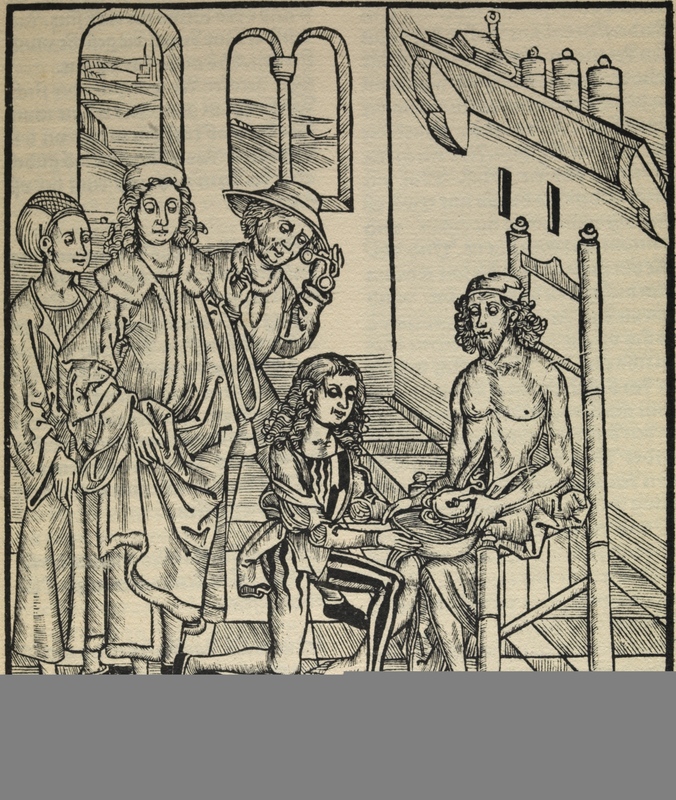 Brunschwig’s first book was the Cirurgia of 1497, the first surgical manual in print. This, of course, was an opportunity to codify and re-define surgery. Brunschwig revives the medieval tradition of what Michael McVaugh has termed rational surgery (i.e. a learned as well as a practical art), to educate trainee surgeons and to present their discipline as a respectable and useful trade. Emphasising the need for skilled hands as well as a working knowledge of the human body, Brunschwig defends surgery on two fronts: against learned physicians’ rhetoric of superiority, and against other craftsmen’s deep-seated anxieties about occupations which were in contact with sick and dead bodies. A surgeon treating an abdominal wound. Hieronymus Brunschwig, Dis ist das Buoch der Cirurgia (Strasbourg, 1497). © Wellcome Images. 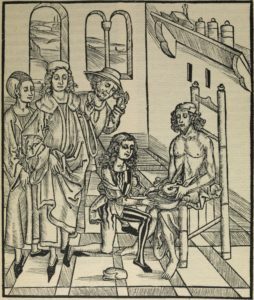 The later books on distillation, published in 1500 and 1512, open up to a wider readership, including not only medical artisans such as surgeons or apothecaries, but also the ‘common man’ – a middling social layer of literate citizens, householders and other lay practitioners. This new kind of medical reader, as I have discussed in a previous post and elsewhere, is emblematised in the figure of the ‘striped layman’ which appears in numerous woodcut illustrations throughout Brunschwig’s works. Many of the recipes and instructions in the distillation books are adjusted for this type of reader. They start from scratch and are rich in technical details which are not found elsewhere in print or, to my knowledge, in manuscript. Although Brunschwig engages with complex ideas about the nature of matter and its manipulation, such as John of Rupescissa’s notion of a ‘quintessence’ in all things, he re-works them into manageable, pedestrian remedies. Rather than pursuing Rupescissa’s heavenly panacea, Brunschwig uses distillation to produce a type of middle-class quintessences: although earth-bound and imperfect, they were reliable and effective remedies in the hands of laypeople. 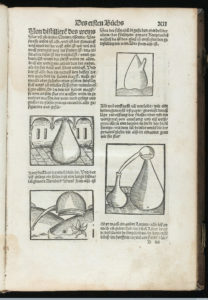 Detailed woodcut images of distillation apparatus and instructions for its use. Brunschwig, Liber de arte distillandi de simplicibus (Strasbourg, 1500). © Wellcome Images. One overarching theme of my thesis is the artisan’s approach to understanding and manipulating nature. For a craftsman with no Latin, Brunschwig mined a surprising amount of knowledge from texts. But more importantly, I argue, he knew things through direct physical engagement with bodies, materials and technical processes. His books are full of instructions to probe wounds, check temperature by touch, inspect colour changes in the alembic, and smell or taste distilled remedies. His expertise was located as much in the body and its senses as in books. Nonetheless, writing was a powerful tool for recording and communicating practical insights. From cautionary tales of exploding alembics to heroic accounts of successful cures, Brunschwig emphasises his own experience as a source of knowledge. The German term he uses for this type of knowledge, erfarung, is related to fahren, meaning ‘to travel’. In the early sixteenth century, it denoted a way of experiencing the world through one’s own senses, by moving through it or simply being in it in an active, attentive manner. Erfarung was compared, often unfavourably, to spiritual contemplation and introspection. Over time, however, doctors and students of nature such as Paracelsus came to see personal erfarung as the necessary labour of insight rather than a sinful distraction. The Book of Nature, they insisted, should be read with one’s feet. Brunschwig’s emphasis on his own and others’ erfarung was thus part of a larger vernacular culture of experiential knowledge, as well as learned debates about experientia which have often been the focus of historical accounts of a medical empiricism developing in the early modern period. Recipes played a major part in Brunschwig’s codification of experiential medical knowledge. Some, as I have shown in a previous post, were presented in Latin pharmaceutical jargon likely unknown to laypeople. These recipes were closed to readers, who were meant to copy them out on a piece of paper and hand them to an apothecary who would manufacture the remedy according to his art and his experience. Although the great majority of recipes are in German, some of these are also presented as tried and tested, by Brunschwig himself or others, and do not call for ‘tweaking’ on the part of readers. Other recipes, however, give alternative ingredients or leave the exact composition up to the practitioner’s judgment. Many recipes come without the author’s seal of approval, and their sheer number makes it seem unlikely that Brunschwig could have tested each one. Such ‘open’ recipes leave room for improvisation and testing. The ongoing work of erfarung runs on into readers’ own practice, and often spills out into the margins of Brunschwig’s printed books. In many surviving copies, early modern healers from different walks of life marked recipes with a magisterial probatum est, or a simple vernacular note such as ‘this one is good’. In some of the earliest medical works in print, Brunschwig addresses a readership of lay healers and ‘common men’ which would come to represent a significant portion of the early German print market. Through his use of recipes embedded within a culture of erfarung, he involved his vernacular readers in a continued effort of empirical trying and testing. Pursuing the themes of recipes and artisanal knowledge, I am delighted to be joining the Making and Knowing Project at Columbia University this summer, and look forward to sharing our work on making, testing, and trying, which has previously featured on this blog. In past centuries, devoid of freezers and heated greenhouses, the seasons affected medicines as well as foodstuffs. In addition to pickled vegetables and stored grain, early modern people worried about their provisions of healing plants and animal substances. These, too, had their season: many herbs were considered most powerful when picked in May, and ‘May dew’ collected from fragrant meadows at this time of year was said to have many healing properties. 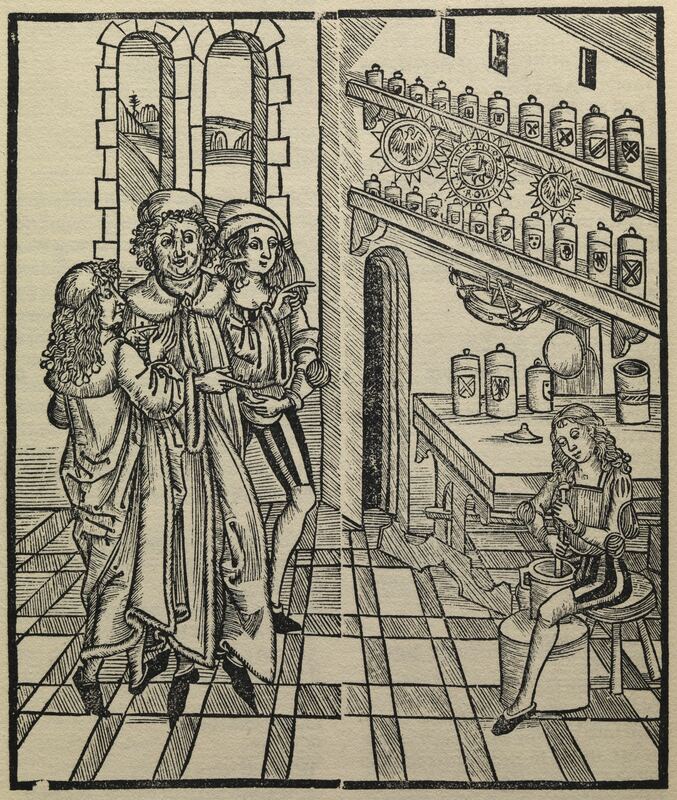 In his Destillierbücher (distillation manuals), published in the early sixteenth century, the Strasbourg surgeon-apothecary Hieronymus Brunschwig addresses the challenges which arise in pharmacy from nature’s cyclical changes. He explains that most preparations of fresh medicinal herbs are ‘unkeepable’. For example, ‘if you pound herbs, roots or other substances and squeeze the juice from it, then it becomes unpleasant, does not last, […] and soon putrid corruption ensues’. Even with dried materia medica and compound drugs, their medicinal virtues faded over time. Brunschwig knew this all too well from personal experience. As an apothecary running his own shop near the fish market, maintaining a stock of efficacious remedies was his chief responsibility and expertise. The issue of pharmaceutical provisioning was taken very seriously by Strasbourg’s magistrates. Twice a year, they would send round a committee of medical experts to all apothecary shops, to ensure that no perished goods were stocked, and to throw away any that had gone off. Brunschwig’s understanding of the material world was shaped by his experience as a pharmacist and shopkeeper, but also by the cosmology and medical theory of his day. While the heavenly spheres were characterised by material perfection and changelessness, all matter on earth was made up of the four elements (air, water,fire, earth) and subject to their constant permutations. They were doomed to endless cycles of generation, change, and decay. Material stability was only possible where the elements were in perfect balance, ‘as you can see in May when it is neither too dry nor too humid, neither too warm nor too cold’. Brunschwig’s seasonal simile is revealing: a perfect balance of elements is just as rare and fleeting as those precious few balmy weeks in May. As well as pointing to the instability of all earthly matter, the language of seasons and their cold, hot, dry or moist qualities was associated with early modern ideas about the stages of human life. Youth, health, reproduction, decline and death were analogous with the annual cycle of flourishing and decay in nature – a relationship which is richly illustrated in a set of anonymous seventeenth-century engravings (see here for an interactive digital reproduction). The idea of changing seasons was emblematic of an early modern view of the material world which was characterised by instability. Human bodies fluctuated with the shifting balance of their humours, and the very substances which could be used to cure the resulting ailments were themselves fleeting and, in Brunschwig’s words, ‘unkeepable’. Faced with such difficulties, Brunschwig and others turned to a branch of knowledge with a longstanding commitment to imitating and manipulating natural processes underlying the transformations of matter: alchemy. In particular, Brunschwig describes distillation as a powerful artisanal technique to ‘keep the unkeepable’. Distillation was the art of separation, and in the case of medicinal simples, Brunschwig claimed, their ‘soul’ or healing virtue could be separated from their ‘body’, that is to say the material dross made up of the problematic four elements. Thus liberated, the healing ‘spirit’ of a plant in the form of a distilled water could be bottled and neatly stored on Brunschwig’s alphabetically ordered shelf, where they would keep well beyond their harvest season, for up to three years. Later Destillierbücher echo the idea that one can ‘keep these waters over the year’ as a major selling point of distilled remedies. While distillation in theory had the power to produce pure and incorruptible ‘quintessences’, this was far too laborious for everyday pharmaceutical practice. Brunschwig wrote for an audience of ‘common men’ as well as artisan colleagues, and most of the distilled remedies he discusses are much more pedestrian. They still have some of the elemental qualities of the original herb, and are ultimately perishable. Compared to ‘unkeepable’ plant juice, however, their decay is slower and more predictable. Brunschwig confidently charts the decline and change in a water’s healing powers over the years, and even gives instructions for ‘recharging’ them. A water can be saved by infusing it with fresh herbs and distilling it once more – thus, Brunschwig reassures his readers, a distilled remedy can ‘prevail against its time’ for another year. In the early modern world of matter, the seasons symbolised cycles of change and decay which spelled trouble for healers and makers of medicines. 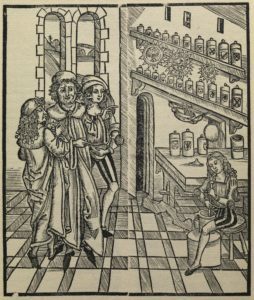 In some of the earliest vernacular works on pharmacy, Brunschwig describes distillation as a powerful tool for defying the material corruption of seasonal changes. 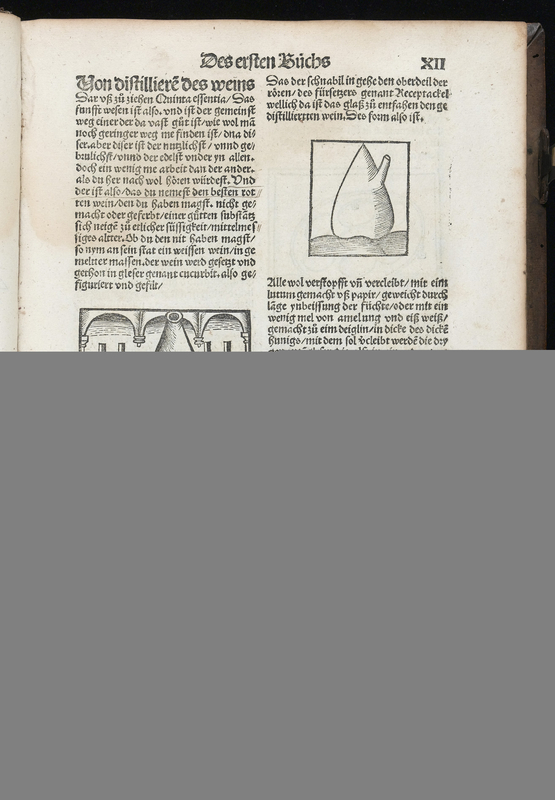 Brunschwig, Liber de arte distillandi de simplicibus… (Strasbourg, 1500), sig. C1v. Brunschwig, Liber der arte distulandi simplicia… (Strasbourg, 1509), fol. 36v. Eucharius Röslin, Kreutterbuoch von allem Erdtgewaechs… (Frankfurt, 1533), title page verso. Brunschwig, Liber der arte distulandi simplicia… (Strasbourg, 1509), fol. 18v.